CTS is often associated with occupational activities but any disorder which results in compression upon the median nerve can result in CTS (1). The National Institute of Neurological Disorders and Strokes reports CTS is "most likely due to a congenital predisposition - the carpal tunnel is simply smaller in some people than in others. Other contributing factors include trauma or injury to the wrist that cause swelling, such as sprain or fracture; overactivity of the pituitary gland; hypothyroidism; rheumatoid arthritis; mechanical problems in the wrist joint; work stress; repeated use of vibrating hand tools; fluid retention during pregnancy or menopause; or the development of a cyst or tumor in the canal" (4). How do Physical Therapists Diagnose CTS? Many tests can be used to diagnose CTS. They include Tinel's test, Phalen's test, a carpal compression test and a test developed by Tetro et al. (5) which involves extending the elbow, supinating the forearm, flexing the wrist to 60 degrees and applying constant digital pressure with one thumb over the median nerve at the carpal tunnel. This test was considered positive if symptoms occurred within 30 seconds. In the study by Tetro et al. (4) they found that the sensitivity of their wrist flexion-nerve compression test was significantly better than Phalen's test (61%), Tinel's test (74%), and the carpal compression test (75%). The specificity of their wrist flexion-nerve compression test (95%) was also statistically significantly greater than that of Phalen's test (83%), but not significantly different than that of Tinel's test (91%), and the carpal compression test (93%). Even with these results, the wrist flexion-nerve compression test should be compared to electrodiagnosis, the gold standard for prediction of CTS (6). 1) Goodman and Boissonnault. Pathology: Implications for the Physical Therapist. W.B. Saunders Company 1998;817-820. 2) Katz J, Simmons B. Carpal Tunnel Syndrome. The New England Journal of Medicine. 346(23):1807–1812. 3) Padua L, et al. 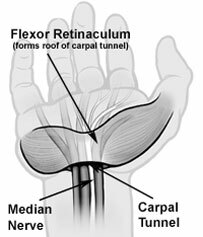 Carpal Tunnel Syndrome as a Repetitive Motion Disorder. Clinical Orthopaedics & Related Research. 1998;351:78-89. 5) Tetro A, et al. A New Provocative Test for Carpal Tunnel Syndrome: Assessment of Wrist Flexion and Nerve Compression. Journal of Bone & Joint Surgery - British Volume. 1998;80:493-498. 6) Johnson EW. Diagnosis of Carpal Tunnel Syndrome: The Gold Standard. American Journal of Physical Medicine & Rehabiliation. 1993;72:1. Editorial.